Browse events and birthdays in history. View the schedules for New York sports teams. Create your own events using this calendar. Choose from several upcoming event styles. This calendar displays events for famous people and historic events in American history. Included is a map of birthplaces and historic event locations utilizing the Google Maps plugin, which is included in the Standard and Pro versions of Zap Calendar. Use the filter to display specific categories. 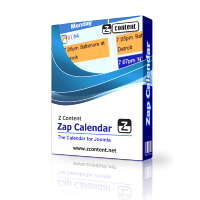 This calendar utilizes the following Zap Calendar add-ons: title, event filter, month header, moon phase, Social like, Google Maps, comment, upcoming events, recent comments and QR code (square barcode).